"Perfect" looking? No. Delicious? Yes...a "10"! When I don’t want fancy, and I don’t want to fuss, my go-to Sunday supper is roast chicken. Much ado has been made about the “perfect” roast chicken. How long to roast, and at what temperature? How to achieve tender, juicy meat? The best rub or marinade? How to achieve golden brown, crisped skin? And so on. When the bar for perfection is so high, who wouldn’t be intimidated?! Roasting a chicken shouldn’t be a complicated affair. You don’t need a lot of gadgetry or encyclopedic knowledge about fancy techniques. It’s less important that a roast chicken look like a food stylist’s dream for a magazine cover than that it actually tastes delicious. A flavorful roast chicken starts with the chicken, itself. It’s the reason why we buy our poultry from Northwind Farms in Tivoli, N.Y., a small, family-run farm that raises free-range, all-natural, hormone-free and antibiotic-free chicken. From beginning to end, it’s a clean operation. And the proof is in the taste: a Northwind Farms chicken tastes like chicken. On Sunday evenings, we’re usually in transit from the country, back to the City. So, I like to keep supper simple. This time of year, a standby favorite is tarragon roast chicken. The sweet anise-like scent of tarragon is synonymous with spring. I love it in artichokes, fava beans, new potatoes, eggs and salmon. 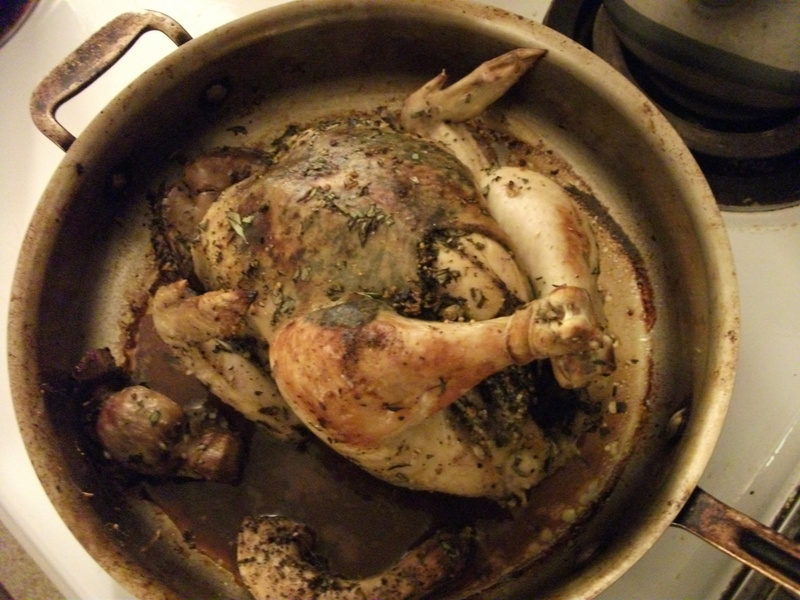 For me, however, the aroma of a tarragon roast chicken is like an intoxicating perfume that I can’t get enough of. The pre-heated pan technique I use is quick and simple, borrowed, years ago, from Mark Bittman of the New York Times. I don’t even use a roasting pan; I use a heat-proof stainless steel All Clad 12-inch frying pan. To tenderize the meat, I do not butter baste or rub a stick of butter under the skin as some recipes suggest. Why add unnecessary fat? Nope. I use lemon juice. It does the trick beautifully. When is the chicken done? After reading Glorious French Food (Wiley, 2002) by chef-author James Peterson, we follow his cue and take our chicken out of the oven when a food thermometer, inserted between the leg and breast (the last part of any bird where the heat penetrates), registers 140°F or higher. Keep in mind that the temperature will increase by 5ºF while the chicken rests. Perhaps, you gasp. We have no qualms about doing this, however, because we know that we are using a high quality, all-natural chicken. Technically, salmonella is killed at 140ºF, but the USDA takes a hyper conservative stance, recommending that you cook a whole chicken until it reaches a minimum internal temperature of 165°F. Makes sense, I suppose, if you’re cooking a factory farm chicken. In theory, you’ll be “safe”. In reality, you’ll have a very dry chicken. Luckily, we know our source. 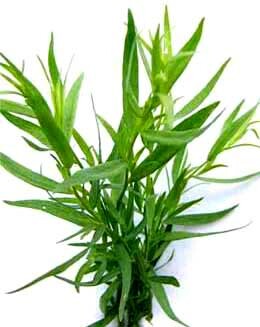 * Tarragon is a strong herb. I like bold flavors, so I’m generous with both the tarragon and garlic. Feel free to adjust. Peheat oven to 450°F. Place a heatproof skillet on center rack for 15-20 minutes. In a small bowl, combine minced tarragon and minced garlic. Set aside. Rinse chicken and giblets well. Pat dry with paper towels. Remove any excess fat and skin. Starting at the neck cavity, loosen skin from the breast and drumsticks and the back by gently inserting fingers between skin and meat. Season chicken with kosher salt and pepper under and over the skin. Spread tarragon-garlic mixture under loosened skin and rub over breast, drumsticks and back. Note: The herbs underneath the skin will give the chicken a bluish hue. Place tarragon stems into the cavity. Optional: Tie legs together to hold its shape. Place chicken, breast side up, into the skillet. It will sizzle—a good thing. Searing the meat locks in the juices. If you have giblets, add them to the pan as well. Drizzle lemon juice over the chicken and under the skin. Place in the oven. Roast 15 minutes. Cover any fast browning parts—usually, the breast—to retain moistness. Turn the pan. At this point, pour 1/4 to 1/2 cup of water to the pan, which adds moisture, and prevent the juices from burning. Continue roasting another 10-15 minutes. Insert thermometer into the area between the leg and thigh. IF you are using a high quality, all-natural or organic chicken, aim for an internal temperature of 145ºF or higher. Otherwise, you may want to aim a higher internal temperature. Slice along the leg where the thigh joins the drumstick: if the juices run clear, the chicken is done. Also: the color will still be a little pink (but not raw or translucent) inside the leg. Transfer chicken to a serving platter. Tent with aluminum foil and let the chicken rest until cool enough to handle. This entry was posted in Food, Health, Home Cooking, Hudson Valley, Hudson Valley Farms, Local Food and tagged All-Clad, Northwind Farms, roast chicken, tarragon. Bookmark the permalink. Roast chicken is often our sunday supper dinner as well, with a side of whatever is in season: potatoes, roasted root vegetables in winter, and now asparagus and ramps, ! And I am with you 100%, it starts with a great chicken. Happy Sunday!